Boston inner city kids find a home at Island Cove. 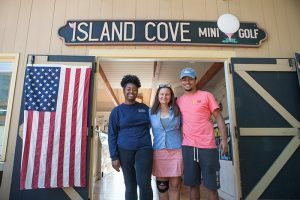 For the second year, Mary Gosselin of Island Cove Mini Golf and the Climbing Wall in Vineyard Haven has included Beacon Academy graduates in her roster of summer employees. 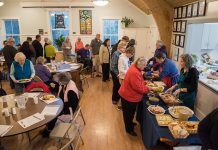 But Ms. Gosselin’s relationship with Beacon began 13 years ago when Beacon, then a new school in Boston, brought its first class to the Vineyard for a summer visit. Beacon, founded by Cindy Laba and Marsha Feinberg, provides a transitional and transformational year between eighth and ninth grades to promising, motivated, and curious students from Boston and surrounding urban areas. 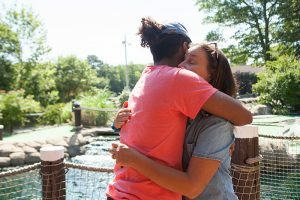 The Vineyard trip, started by Feinberg, a summer resident whose own kids had the privilege of spending summers here, provides the students with a visit before starting their year of intense studies, after which they apply to elite independent high schools and then colleges. During their short visit, Beacon kids not only play mini golf and scale the climbing wall, they swim at the Inkwell and Great Rock Bight, visit Morning Glory Farm, meet Nat Benjamin to learn about boatbuilding, and attend a cookout at Rosabeth Moss Kanter’s house, where they meet artists, activists, and writers. They even hold discussions with Alan Dershowitz and Jackie Jenkins Scott. They ride the Flying Horses and wander Oak Bluffs with an ice cream cone, according to Feinberg. At the end of their busy days, Island families host them. Last summer, however, Ms. Gosselin needed a manager, and she knew Beacon and its tough-love philosophy, which is similar to hers. 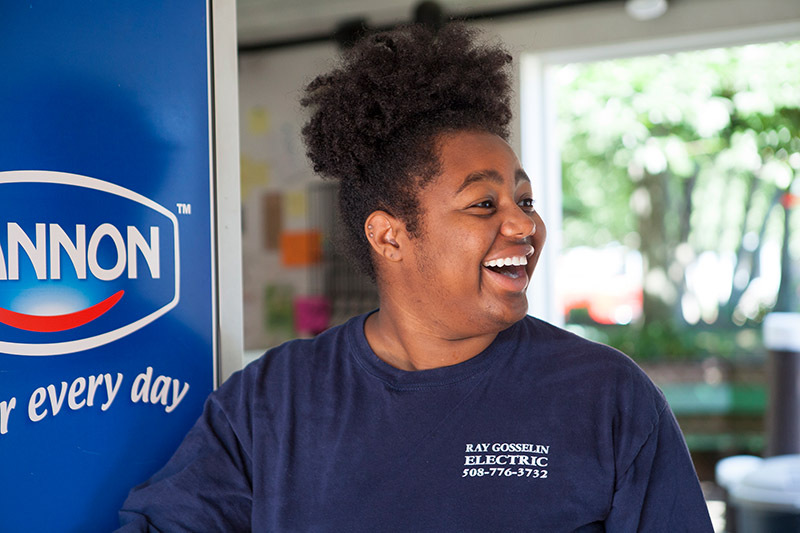 She and Ms. Laba thought older Beacon kids — those in high school or even college — could be a great fit for her business. Both organizations believe in consequences. “You learn from it. You get real information from your mistakes,” says Ms. Gosselin. Ms. Laba, in charge of Beacon alumni, prescreened applicants who might be interested. Zenobia Houston, a rising senior at Ursuline Academy, fell into it at the last minute. “The timing was perfect,” she says. One benefit to the arrangement was that housing was included — at a cost. They live with Gosselin and her husband Ray. They pay rent and buy their own food. It took a week of eating Back Door Donuts before they started to buy groceries for themselves, the teens say. Ms. Houston, 18, is a fan of ramen noodles, and Mr. Ramsden, 17, has found a fondness for microwavable meals. In addition, they are learning budgeting, and each is putting away money every week. They have also learned to manage their time. No one is going to wake them up to get them to work, they say. Ms. Gosselin is not a babysitter. If work begins at 9:30, you better be there. “She treats you like an adult,” says Mr. Ramsden. 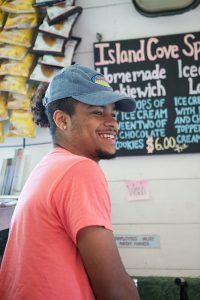 The teens agree that they’re learning how to manage their time better, and Ms. Gosselin also shows them how to stress less, emphasizing that the Island is slower than the city with which they’re familiar. Ms. Houston has “unplugged” and turned off much of her social media. One evening by the Lagoon, she was swarmed by fireflies, which she’d never seen before. “They were lighting up a path. It was magical. Just beautiful,” she says. “I am unlocking their personalities,” says Ms. Gosselin. “Boys are intimidated by brooms.” So she makes sweeping into a game of hockey. The broom is the stick and the dirt is the puck. Soon sweeping and cleaning is fun. 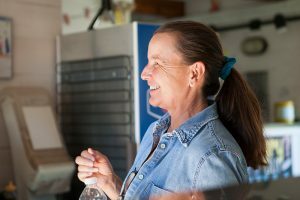 She also works on the importance of body language, including eye contact, standing up straight, greeting customers, and enunciating. “It’s teamwork here,” says Ms. Gosselin, and her team consists of 11 to 18 workers as young as 14 and as old as 75. Everyone works all positions except cooking, including ice cream, waiting on customers who want to golf, and cleaning. Ms.Gosselin says they’re always cleaning. Selling tickets and making sure the flow is going is also a priority. On a busy day there can be 90 visitors going through in 45 minutes. “We run it tight like a ship,” she says. Mr. Ramsden says he has learned to focus on the customer, to treat them the way he would want to be treated, to smile, to use his charm. In the middle of a sentence, he jumps from the picnic table where he’s sitting and runs inside to help a family who is wandering around looking to start a game of mini golf. “Mary and Ray continue to hold the bar high,” he says. “And they’ve welcomed me with open arms. Ms. Houston says, “I’m learning to slow down, to be aware of my body, that I need to go to bed at 11 to be up at 9.” Ms. Gosselin works them hard. But she works right by their side. If she wants them to clean toilets, she does it with them. She says no job is too low for anyone to perform, and everyone should know how to do a job you might be supervising later in your career. If someone makes a mistake, and Ms. Gosselin says she still makes them and that’s what life is about, they talk about it. “We sit down and talk. We discuss 110 percent. You might get the door at your next job,” she says. “It’s hard. These kids have been transplanted from one world to another,” she says. “This Island is so diverse,” says Ms. Houston. “I’ve never experienced racism here.” After thinking about it, however, the teens’ acknowledge that the Island is somewhat segregated. The teens say that Beacon has had a huge effect on their success on the Vineyard. “You have the ability to think for yourself, to know who you are. I can speak for myself,” says Mr. Ramsden. For Ms. Houston, “being Beacon” means she doesn’t feel uncomfortable around anyone. “I’m a dark-skinned black woman. Race, gender, financial ability: People are people,” she says. Their different experiences on the Island have taught them something about the Vineyard too. Coming for two days, they say, you see the vacationers. Coming for two months, you see the community that live here year-round, who work here. It’s less luxury, more normality. They’ve heard it’s more quiet with less traffic, during the off-season. And in case you’re wondering, Ms. Gosselin nods and smiles at the thought of hiring Beacon again. “Oh, yeah,” she says.